Deep South Dish is one of my favorite blogs to visit! Mary not only posts fabulous, family-friendly recipes, but you can tell she's smiling and drawling y'all while she writes. I was reading a Deep South Dish post the other day, and clicked on another recipe, and then another... that's what happens when you start reading through Mary's site! Well, I came across her recipe for Perfect Southern Sweet Tea. Hm. Who needs a RECIPE for tea?! I first thought. BUT...my tea never seems to be very consistent. I like a strong tea flavor, but it usually ends up bitter. I had an "Aha! moment" after reading through Mary's detailed tea recipe and knew I MUST give it a try. 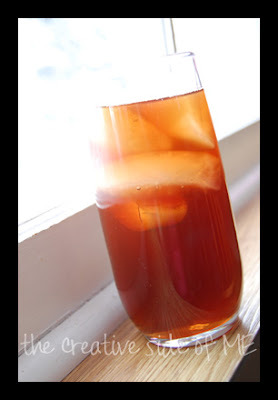 So, click yourself over to Deep South Dish and print out the recipe for Perfect Southern Sweet Tea! Mary, thanks for sharing yet another winning recipe! Heavenly! Have to try this!! oh man!!! My hubby would LOVE ME to death if I made this for him. He loves his sweet tea! Traci, This tea has become hubby's drink of choice lately. I made it with raspberry teabags the other day, and he loves it. He wants me to try peach teabags next. Mary at DSD uses 5 bags/5 minutes. I do 6 bags/8 minutes with the pinch of baking soda. Definitely a hit here!